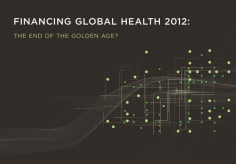 Financing Global Health 2009 provides the most comprehensive picture available of the total amount of funding going to global health projects spanning two decades. 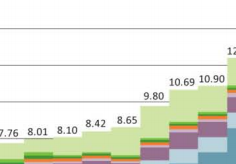 It takes into account funding from aid agencies in 22 developed countries, multilateral institutions, and hundreds of nonprofit groups and charities. Prior to this report, nearly all private philanthropic giving for health was unaccounted for, meaning that nearly a third of all health aid was not tracked. 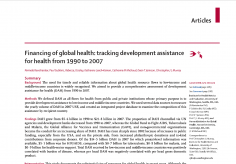 This is the first of an annual publication providing valid and consistent time series data for tracking global health resources and offering in-depth analyses in the following three areas: development assistance for health, government health expenditure, and private health expenditure. 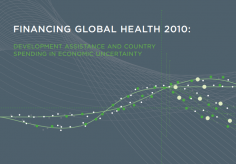 This first report focuses on development assistance for health. 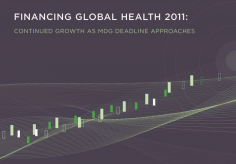 Several errata were found in the Financing Global Health 2009 report. These errata have been corrected in all the online materials. Institute for Health Metrics and Evaluation. 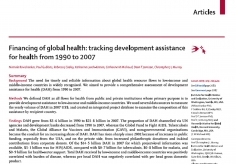 Financing Global Health 2009: Tracking Development Assistance for Health. Seattle, WA: IHME, 2009.